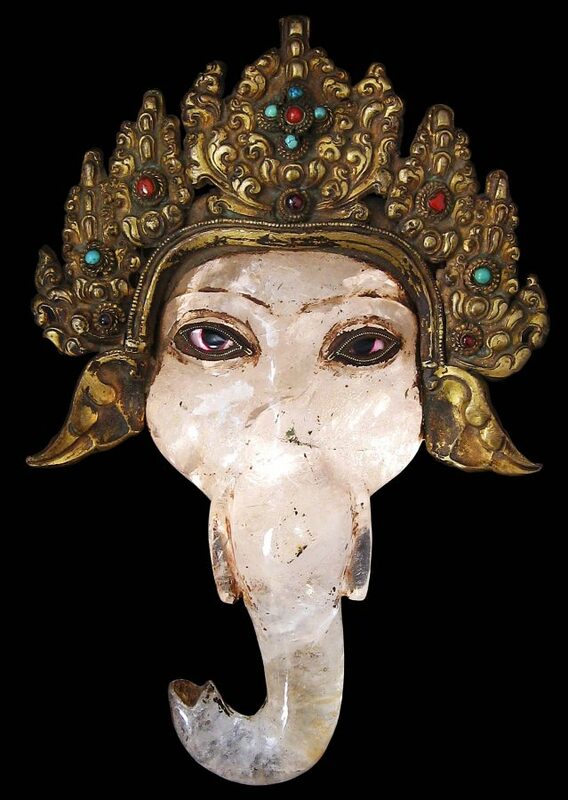 This extraordinary image of Ganapati (the Buddhist name for Ganesh; Tsog Dak is the Tibetan name) is fashioned from a single, large piece of rock crystal with gilded copper mounts with applied stones. The size of the rock crystal gives the piece considerable weight for its size – it weighs almost two kilograms. The image features a curling trunk, a pair of tusks, and mournful rock crystal eyes with black pupils and reddish sclera surrounded by pearled gilded metal mounts with prominent tear ducts. 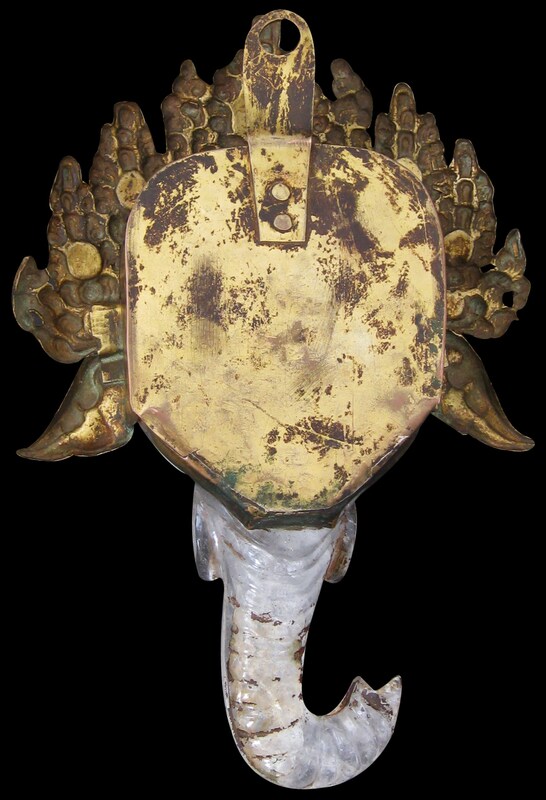 The gilded copper crown (from which a pair of ears also protrude) is in floral form with nine peaks. It is embellished with twelve gems in box mounts. The gems may be a reference to Ganapati’s role as god of wealth. The upper part of the reverse of the image is enclosed in gilded copper with an applied hook to allow the image to be suspended, perhaps in a shrine. At one point the image was coated in a yellow pigment and animal glue mix but this has now largely worn away. It is not unusual in the Buddhist world for religious objects and images of deities to be made of precious material and then to have them covered with gilding or some other colouring in lieu of gilding. When items are viewed purely on aesthetic grounds then this practice may not make sense but these objects are first and foremost items of a religious nature. The use of precious material in the first instance is an act of merit. To then cover this material with gold leaf or a coloured pigment is a further act of merit. The use of inlaid stones and the form of the metal work suggests that the Ganapati possibly was made by Newar craftsmen operating in Tibet, possibly in the Gyanste region. There is a wide variation of datings ascribed to Tibetan rock crystal items. But with the patina on the gilded copper mounts of the Ganapati here a dating of around the early nineteenth century is suggested. Ganesh, the elephant-headed god, is one of the most widely worshipped deities in the Hindu pantheon. His image is found throughout India and Nepal. Hindi sects worship him regardless of affiliations and devotion to Ganesh extends to Jains and some Buddhist sects including the various strands of Buddhism found in Tibet. Ganesh is widely revered as the Remover of Obstacles, the god of wealth, and as a patron of arts and sciences, and the deva of intellect and wisdom. Among Buddhists, Ganesh generally is known as Ganapati. Many Buddhist traditions regard elephants as sacred. Buddha’s mother, Mahamaya had the dream of a white elephant announcing his birth. Ganesh appears in Mahayana Buddhism, not only in the form of the Buddhist god Vinayaka, but also as a Hindu demon bearing the same name. His image appeared in Buddhist sculptures during the late Gupta period. As the Buddhist god Vinayaka, often he is shown dancing. This form, called Nritya Ganapati, was popular in northern India. Later it was adopted in Nepal, and then in Tibet where he is known as Tsog Dak. Tibetan representations of Ganesh tend to be ambivalent. In one form, he is shown being trodden under foot by Mahakala, a popular Tibetan deity. Other depictions show him as the Destroyer of Obstacles, sometimes dancing. It is difficult to determine the form of Ganesh or Tsog Dakhere. But the facial features and the crown are in keeping with Tibetan images with show him in the dancing form.